Save time, work more efficiently, own your events. While event hacks might be a stretch, these time-saving event tips will help cut out the noise and focus on your main objectives. Let's be honest, event planning is a stressful job. At any given time there are a number of jobs that need to get done and it can seem like every deadline comes right down to the wire. The 18 tips in this blog post will help you save time during the event planning process and ensure your next event is wildly successful. Let's dive right in. As you know, planning an event is a monumental task. The more time you can give yourself to nail down every little detail, the better. So start as early as possible. This will not only allow you to maintain your sanity, but also give you an advantage when booking a venue, finding event staff (we'll talk more about this later in the post), and putting out unavoidable fires. Want to maximize event ROI? Then do yourself a favor and leverage the power of event software when planning and managing your next event. This type of tool will save you time (on average, businesses that use event software save 223 hours a year) and craft a unified brand experience for each of your attendees. "[Event software] helped us take full advantage of our event data and draw key insights that were crucial to our success." —Melissa Moore, Co-founder of the Lean Startup Co. Even software, while incredibly important, isn't the only tool you should consider investing in. There are other important event tools worthy of your consideration as well, such as project management apps like Trello, marketing automation tools like HubSpot (more on this below), software integration tools like Zapier, and event streaming software like Livestream. There are plenty of amazing apps out there that will make your life as an event planner less stressful. The key is finding the tools that work for you and the kind of events you manage. So do some experimenting and create a custom event technology stack that fits your needs and your budget. Knowing how to best prioritize your time and efforts is a common productivity tip. The more focused you can be on the right objectives, the more success you'll see. This is especially true when planning an event. There are a million different things that need to be accomplished in order for your event to be deemed a success. Where do you start? Understanding what's most important and what deserves priority will allow you to focus on the big wins; the things that really matter. First, determine what your overarching vision is. Then prioritize your to-do list based on important tasks, not just urgent ones. Finally, tackle each item on your list one at a time. This simple framework will ensure proper time management when event planning. As we've already mentioned, event planning isn't for the faint of heart. The good news is, there are proven templates and processes you can follow. You aren't the first person to plan an event and you won't be the last. Look to the successes and failures of those who have gone before you to gain valuable insights. This event strategy guidewill get you started. In it, you'll learn everything you need to know about hosting a successful event in 2019 — the planning, launching, promoting, managing, and even wrapping processes are all covered in detail (more on this below). Let's delve deeper into prioritization and how creating lists can assist. Whether you consider yourself a "list person" or not, writing things down and structuring your day in a specific way has its benefits. Start by determining every single thing you need to get done. This list should include the big things like booking a venue and finding sponsors, and the smaller (but still important) things like hiring an event logo designer (or coordinating with your in-house design team). Once everything has been written down, you can begin to schedule each task for specific days. Remember to set deadlines for every to-do item and check them off once they've been completed. This will keep you organized and on track. It will also engage your team and help them feel more invested in their work, which will boost their productivity and decrease company turnover. Do your best to delegate the right tasks to the right employees, give them clear guidelines and expectations. Then allow them to work independently. Delegation isn't useful if you constantly need to look over their shoulder. Sometimes delegating tasks to your team isn't enough. You may find it necessary to hire event freelancers to help you achieve your goals. What can a freelancer help you with? Many things including website development, customer support, and event photography. Discover where the holes are in your team, then plug with talented individuals from sites like UpWork and Freelancer or online communities like Eventovation. Not every event helper needs to be a hired gun. Finding event volunteers is totally possible, especially if your event's main purpose is to raise awareness or money for a charitable cause. You just have to ask. Start with the people you know. Will any of your employees be willing to lend a helping hand. When you've exhausted your personal contacts, look to volunteer networks. Software tools like Volgistics and VolunteerHub give event planners access to information on thousands of skilled volunteers. Remember, just because you aren't paying volunteers doesn't mean they shouldn't receive any incentives for helping out. If possible, offer helpers free admission to your event, complimentary food, or free products from your company to drum up interest. Sometimes the best way to ensure your event is a success is to partner with an event agency that specializes in helping companies host amazing get-togethers. Fortunately for you, we've already done the hard work of finding these organizations. The list, linked to below, contains over 150 top-tier event and experiential marketing companies. Some focus on specific event types, others are full-service, but each is great at what they do. If you feel in over your head, enlist the help of one of these event agencies. 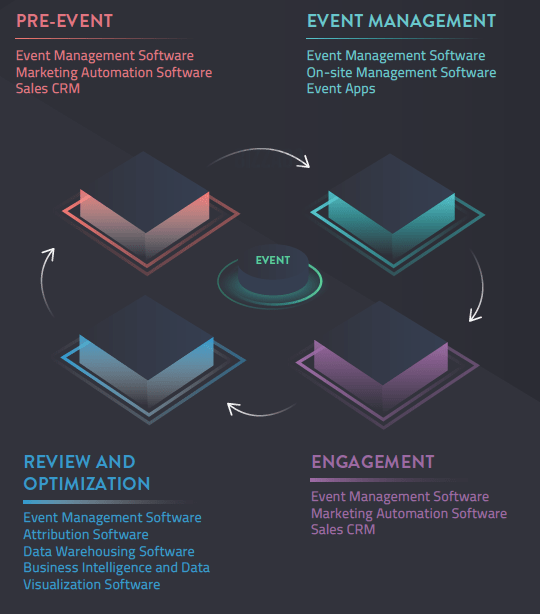 Event marketing automation software such as HubSpot, Marketo, and Salesforce, and to a lesser extent, Get Response, Infusionsoft, and Autopilot, allows event organizers to better engage attendees and produce more personalized event experiences. Imagine being able to, once an attendee registers for an event, automatically add them to your company's CRM records, send them pre-written emails at specific times that correspond with exactly where they're at in the customer journey, and more. This is all possible with the right software platforms and a bit of knowledge and forethought. A sample marketing automation workflow for an event. Customer Relationship Management (CRM) software is essential for most businesses in this day and age. Your company's customers want personalized experiences. This is nearly impossible to provide without an accurate and deep knowledge of your customer base. Events are key touchpoints in multichannel marketing strategies. Tracking how an event contributes to a customer or prospect’s lifetime journey with your company is a valuable metric to have. Every registrant's details should be synced to the CRM of your choice after your event, then incorporated into future marketing and sales efforts. Many event planners tend to do their reporting manually via spreadsheets. Not only does this take a lot more time than it needs to, but it's also more error-prone. Instead, use software to automatically crunch event metrics and generate reports. We recommend using data visualization software that can reconcile data from multiple sources including your company's CRM and marketing automation solutions. But it would also be wise to invest in software tools (like Bizzabo) that are able to generate their own comprehensible and easy to understand reports about event performance. A glance at reporting in Bizzabo. We've mentioned numerous pieces of software and technology so far in this post. Each, when used correctly, is incredibly useful. But the real trick is getting each tool to play nicely with the other apps you plan to use. That's where event software integrations come into play. Some software solutions will integrate with one another out-of-the box. Others require using a third-party integration solution like Zapier. This means that your event management software, CRM tool, email marketing platform, and more will all work together seamlessly, reducing the amount of tedious data entry you'll need to do. We recently got a chance to sit down with our friend Aleksandra Panyukhina, Head of Event Marketing at SEMrush, and learned quite a bit. Her team participated in dozens of events in 2018 on five different continents. So when it comes to event planning, she's a verified expert. In the interview, Aleksandra talked about the importance of systems and scaling. One of the SEMrush keys to success has been their ability to maintain a consistent brand image, no matter the size or location of their next event. This can only be done by developing the proper systems that will scale and maintaining clear communication with team members. Measuring event ROI is an important practice. After all, you can't accurately determine if an event is successful or not without understanding what your company is gaining in return for all the time, effort, and expenses it's taken to host the event. Unfortunately, tracking event ROI isn't always easy, but there are a few tools that can help. Marketing platforms like Bizzabo and HubSpot, business intelligence software such as Sisense and Tableau, attribution platforms like Google Analytics, and your company's CRM software can all help you track event ROI. It's important to remember that you should be aiming to create value with your events, not just immediate monetary gain. An event that loses money, but generates a large amount of high-quality leads may still be deemed successful. Email for event planners is a necessity, though it's all too easy to get bogged down when messages are constantly hitting your inbox. It can feel like you're always playing catch-up and the goal of inbox-zero will never be met. But it doesn't have to be this way. Use Technology: An app like Boomerang can help remind you to follow up on emails you don't hear back on. Use Canned Responses: How much of your time is wasted sending essentially the same reply to multiple people? Get that time back and leverage canned responses. Filter Your Messages: By better organizing your inbox, you can reduce stress levels and increase efficiency. Perhaps all messages from a certain client go into one folder. Or maybe you create a "Respond Later" folder so you don't constantly feel the need to respond to every message right away. Hit the Unsubscribe Button: Do you honestly read and enjoy every single message that floats through your inbox? Probably not. Start unsubscribing and reduce the emails you need to filter through every day. Finally, with so many variables involved in event planning, not everything will always go as expected. It's better to plan for this. We recommend you schedule extra time for last minute requests, especially in the final few weeks before your event takes place. That way you aren't caught off-guard and will have enough time to accomplish what needs to get done. These tips, when used together, act as a sort of event planning template and will help ensure your next event is a success. We encourage you to read through these strategies again and begin implementing as many as possible into your event planning workflow. Looking for more event planning wisdom, check out this report on the latest event trends.